This post is going to take a different turn from what I envisioned in those days while we were still dreaming of baby #2. I'm here to say that it's okay if you DON'T feel any differently. Because honestly, I didn't. When I saw 2 lines on that stick in June, the same joyful tears flowed down that did back in 2014. I loved and wanted the baby just like I did the first time. I started guessing from day 1 if the baby was going to be a boy or girl (for the record, I am terrible at this game and have been wrong both times). I was scared of having a miscarriage this time just like I was the first time. I think if most women are honest, we all hold our breath that first trimester praying and hoping the baby stays alive. The only difference this time around was the faith that I could handle whatever was thrown our way. After losing our first baby halfway through the pregnancy, dealing with a chromosomal abnormality, having surgery... I knew that even if the worst happened, God would get us through it. The point of all this rambling is to say this: it's okay if you have a hard time connecting with a pregnancy after miscarriage. It's okay if you're scared out of your mind that the same thing will happen again. None of that makes you a bad mom. It just makes you human. It's also okay, however, if you don't feel differently the second time around. It's okay if you love the baby just as quickly as you did your first. It's okay if you smile and tell the world the good news as soon as you find out. None of that makes you naive or incapable of accepting the past. Pregnancy after miscarriage can be scary, but for me, it has also been a beautiful reminder of how redemptive and good our God is. Because every post needs a picture, here's a shot of baby #2 at 17 weeks! To many it's just another picture of a bump, but to me it's a reminder of God's grace and goodness. This is so lovely. God's time is perfect, and who are we to question Him? He knows exactly how and when to heal our fragile hearts, and I'm so glad to see you so happy and glowing! Such a beautiful post. God's plan is so perfect. I am so glad that you wrote this. I stayed with a friend for a week last week who has 3 boys under 4, but her first pregnancy was a miscarriage, which she told me at the time, but we haven't lived near each other in the last 6 years. And last week was the first time that we got to talk about it. 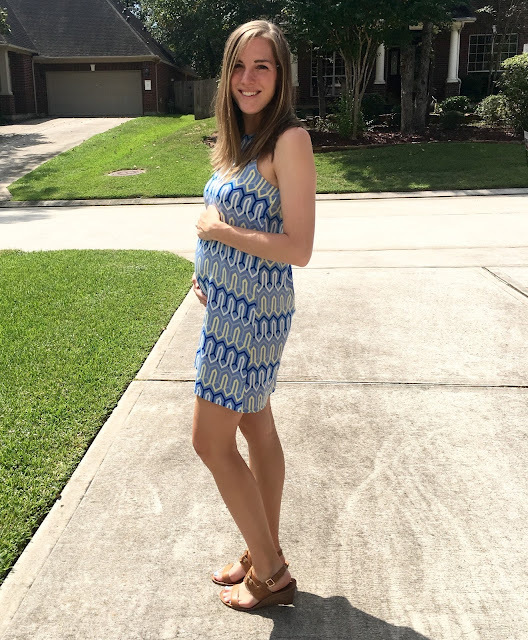 I've never experienced one or a pregnancy, but I felt honored to get to talk about how it affected my friend, her current children, and her life. After talking to my friend, your post seems extremely helpful and encouraging. This is a wonderful post. You look fabulous, BTW! Your outlook is just delightful. Way to look through with your faith and be able to be grounded in His promise for us. Also you are looking great! Your positivity is so beautiful. I'll be praying for you guys and this baby!